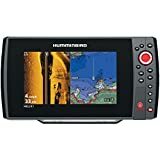 Humminbird fish finders are of great quality as is the Humminbird Helix 9 SI GPS KVD Finder. It is the perfect device made for professional fishermen because it contains many exceptional features such as the 360 imaging which allows you to see all around the water. The Helix 9 is in no way disappointing because nearly all the defects from the previous models were eradicated in this machine. Such as the display is high defined which means that you can easily see in harsh sunlight. An internal GPS unit is also included which is very much facilitating. Most of the cheaper fish finder machines have very less memory which makes them uncomfortable to use because you cannot save more maps and screenshots of the device. However, this Humminbird fish finder, unlike others, has a dual memory card slot. This means that you can save even more and more data in your Helix 9. Use one slot for saving advanced cartography maps and the AutoChart Live maps. The other one can be brought into use for saving screenshots etc. The Helix 9 is seriously a machine, not to be ignored. Do give it a try for perfect fishing. The Humminbird Helix 9 Fish Finder is a very worrying thing when the map of a particular place is not already drawn into the fish finder machine. However, this is not a problem with the Helix 9 because it features the AutoChart Live. This is a technology which allows you to draw digital maps of the places whose maps are not already drawn into the device. Therefore, if you go to a place which is not recognized by the Helix 9 you can yourself create a live map of that area and save that on the memory card. This feature is very beneficial. Machines such as Helix 9 are the perfect fishing companion for you. This is proved by its high popularity among users. Therefore, the machine received an overall rating of 4.4 out of 5 stars. Even being expensive was not reported by many users because the Helix 9 is exactly worth its price. It combines three sonar technologies to give you a perfect fish locating system along with the internal GPS unit. Similarly, the software of your Helix 9 unit is upgradeable so you can have all the recent updates on fishing. Also that the Ethernet facility is included so you can now connect with other Humminbird devices. It is a must buy.